ClearOS Professional 6.5.0 Beta 2 has arrived! Along with the usual round of bug fixes and enhancements, version 6.5.0 introduces Marketplace enhancements for quick deployments, QoS, Network Mapping, a Network Detail Report, an Administrators Control app,Official Amazon EC2 Support, a Software RAID Manager, Mail Archive, an updated Web Server app, as well as new reporting features. 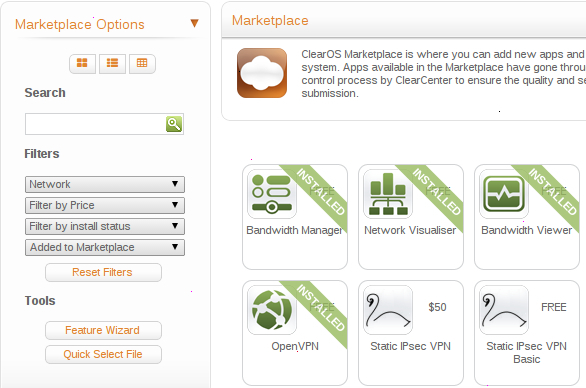 In addition, you can start testing ClearOS Samba 4 support! For details, see Samba 4 / Samba Directory (Beta). The following is a list of features coming in ClearOS Professional 6.5.0.